(2) LULAC GLANCES Iowa Lulac State Convention held June 14, 1969 at the Hotel Savery, Des Moines was the best ever according to comments from all the members present. The business discussed and acted upon at this convention proved to be one of the most interesting and stimulating of recent years. John Terronez was elected Iowa State Director for a second term. Mrs. Ila Plasencia, of Des Moines Lulac #306 was elected Deputy State Director. Alex Pabon was re-elected for a second year as District Director #1, and John Vasquez of Council #10 and Fort Madison fame was re-elected as District Director #2. Honored Guests were none other than Roberto Ornelas and his wife; Alfred Hernandez, the past Lulac National President; Jim Silva from the National Alliance of Businessmen out of Washington D.C.; and Ed Pena who was State Director of Washington, D.C. Also present were State Representative John Tapscott of Des Moines and John Schmishauser, former Congressman of the 1st District and Honorary Member of Lulac Council #10. Miss Josephine Salazar of Des Moines was the recipient of the State Scholarship which is for $600.00. Miss Salazar is now attending Mt. Marty college at Yankton, South Dakota. Man of the Year Award went to Salvador Lopez of Council #10, and Woman of the Year went to Francis Ramirez of Council #304. Tapscott was honored for his work in the Legislature dealing with Migrant Housing Laws. Site for 1970 Convention is Davenport. Lulac National Convention held at Long Beach, California from June 26th to 29th saw Alfred Hernandez elected as National President once again. Hernandez succeeds Roberto Ornelas who succeeded Hernandez. Lelo Jacques, from El Paso, was elected First Vice-President. Mrs. Julia Sozya was elected 2nd Vice-President. Denver, Colorado was selected as the 1971 National Convention Site. The 1970 Site is McCellen, Texas. Delegates from Iowa were Henry Vargas and Humberto Jiminez of Davenport along with the State Director of Iowa, John Terronez. The revised National Constitution is far from being ready due to many technicalities. As of this date (Oct.) it is in limbo. Guest speakers were: Martin Castillo from the Inter-Agency on Mexican Affairs; Sam Symmons from H.U.D. and movie star Gilbert Roland, who gave a stirring speech on the valor and bravery of Mexican Americans in the Armed Forces. An additional National Vice-President was created thereby giving Lulac three National Vice-Presidents. The new Vice-President will be in charge of Youth Activities. This is to be followed on a State level so that an additional Deputy State Director will be created to be in charge of youth activities. To be also followed to the Council Level where an additional Council Vice-President to be created to be in charge of Youth Activities. This is to be done when the revised constitution is okayed at the Supreme Council Meeting possibly. Iowa State Director meets with Cesar Chavez on Tuesday, July 1, 1969 in Delano. California. John Terronez, State Director of Iowa, was fortunate in talking to the leader of the farm worker's struggle in Califronia. Terronez was accompanies by his younger brother, Randy and both were given a tour of the Delano area and were introduced to office staff of the United Farm Workers Organizing Committee, U.F.W.O.C. The Grape Boycott is now in its fourth year and all Cesar Chavez asks is that we not buy California and Arizona grapes, and that we ask everyone who is familiar with the plight of the farm worker to support this cause. Dignity and justice for the farm worker. What could be ore fair for the poorest of the poor ???? 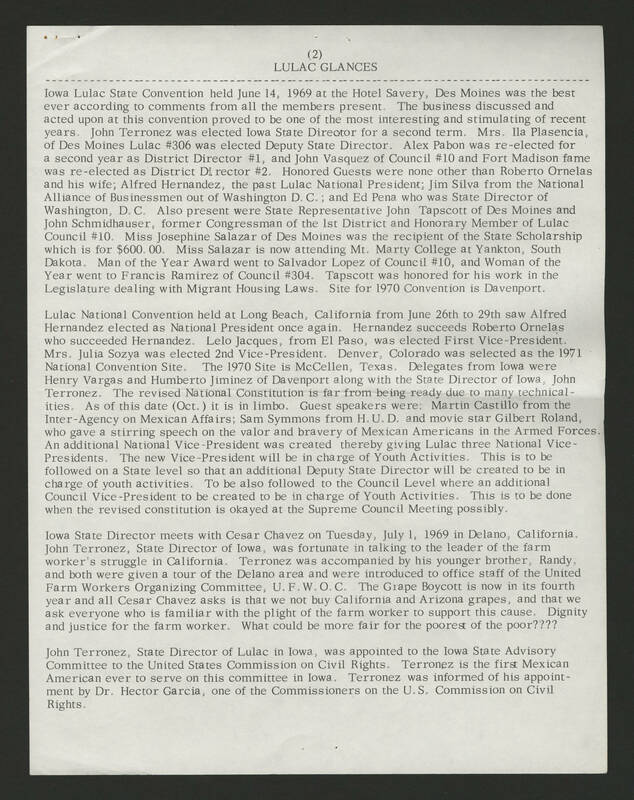 John Terronez, State Director of Lulac in Iowa, was appointed to the Iowa State Advisory Committee to the United States Commission on Civil Rights. Terronez is the first Mexican American ever to serve on this committee in Iowa. Terronnez is the first Mexican American ever to serve on this committee in Iowa. Terronez was informed of his appointment by Dr. Hector Garcia, one of the Commissioners on the U.S. Commission on Civil Rights.